FOR SOME, THE presence of overseas players always seems to be a contentious issue. Professional rugby is a relatively young sport, and the financial offerings have given players a different reason to up sticks from their native land and local club. The word mercenary can be carelessly flung around, but this is sport, there is no shame in doing the best for your career — we all know how short and precarious this sport makes such a thing anyway. Even clubs, like Leinster’s opponents in the Aviva Stadium today Wasps, must sometimes change the scenery and move lock, stock and barrel in order to stay afloat. We’re fortunate in Ireland to have four ancient provincial boundaries that form a large catchment area for the four professional outfits. The union’s efforts to make the most of that fortune and promote Irish qualified players is to be commended too, even if the phrases involved in categorising players can run the risk of slightly alienating a new arrival. By now, Isa Nacewa is one of the names and faces most synonymous with Leinster’s rugby history. In his second spell in Ireland, he is the democratically elected captain in a team which today boasts 12 homegrown (including the east-of-the-Shannon-born Robbie Henshaw) players in the starting XV, but even he needed someone to make the effort to ensure he wasn’t made to feel like an outsider. “I felt very accepted, very quickly,” said the man who arrived from the Auckland Blues in 2008 before raising a family here. Simple words, but the timing of the interruption from the towering Meathman left an impression with the Kiwi. Speaking just over 24 hours out from the Champions Cup quarter-final against Wasps at the Aviva Stadium, Nacewa was understandably reluctant to draw any comparison with the Coventry-based club. But the mood in Leinster, after some testing times, is in a good place. “We know what world-class players they are. But, we are tight here. We really are. The club is in a great position. There is a great feeling around Leinster, at the moment. With 50,000-plus tickets sold, we know we’re doing something right. “There is a positive vibe around the place and that’s what we will just continue to encourage. Email “Isa Nacewa and the moment Shane Horgan made him feel part of the Leinster family”. 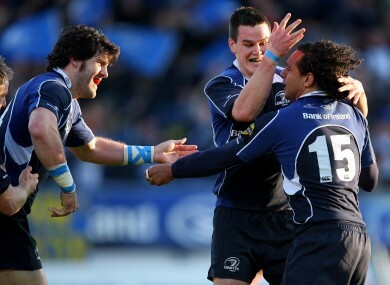 Feedback on “Isa Nacewa and the moment Shane Horgan made him feel part of the Leinster family”.